One the most important component of a Web GIS application is the GIS Server. A GIS Server is a software that listens for specific request (by clients). These requests could be for different services (i.e. OGC compliant) like getMap request etc. A GIS server loads a dataset (e.g. a shape file or a Geo-Tiff) renders it, cut image into tiles and sends it back to the requesting client. Every time a client pans or zooms, GIS server receives requests and sends image tiles as response. 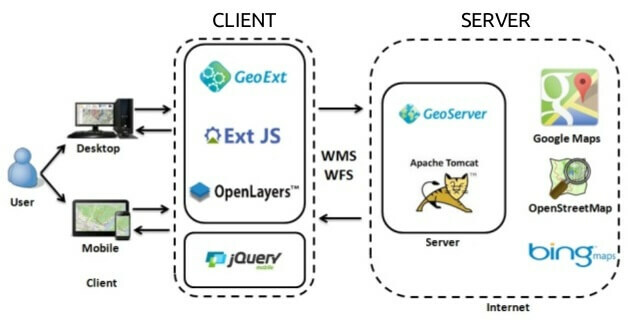 There are various Open Source options to choose for a GIS Server (i.e.https://www.gislounge.com/open-source-gis-applications), however this tutorial will focus onGeoServer (http://geoserver.org/), which is one of the most commonly used frameworks. GeoServer has an edge over others because of its administration tool i.e. web based administration interface and its simplicity deploying a dataset as a WMS, which make it an ideal option for beginners in the WebGIS industry. Spatial Information dissemination and integration inside the majority of information frameworks was cultivated by innovative technological advances. As of not long ago, spatial data was conveyed by means of paper, settled electronic media (CD-ROMs or DVDs) or system based electronic media. Today, GIS services are utilized to transmit spatial data over the web. The advances in Information and Communication Technologies have changed the way in which spatial data are distributed. Today, Web GIS is utilized to disseminate maps over the Internet. Spatial Information tends to be created, stored and managed by local providers, however it is available to various clients anyplace and whenever. This approach empowers a client application to get to spatial data across different networks and sources. The scope of this tutorial is to familiarize beginners or newcomers to the WebGIS industry about WebGIS development frameworks. This guide outlines the configuration procedure for getting GeoServer installed and setup to serve geospatial datasets as a Web Service.